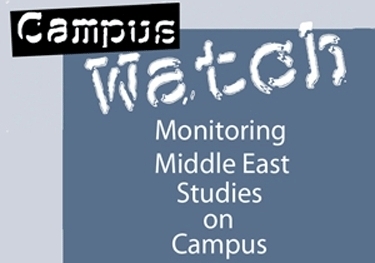 Campus Watch, the Middle East Forum's project to critique Middle East studies in North America, opened its metaphorical doors on Sept. 18, 2002, to a hysterical opposition from the academics that did much, thank you, to propel it to prominence and effectiveness. Middle East studies are no longer so prominent as before. The Middle East may be as much in the news as ever and Middle East studies as influential as ever, but the topic has lost its newsy quality and settled into a certain routine. One reason for that, Martin Kramer points out to me, is the 40 percent reduction in federal funding for area studies under Title VI of the Higher Education Act, which reduced Middle East studies both for university administrators and the general public. This reduction originated in efforts to reduce the overall deficit but it also reflects dissatisfaction at the political level in Middle East studies dues to its poor work. An example of a taxpayer-supported Middle East center's outreach activities, in this case, Harvard's. Stanley Kurtz, Martin Kramer and Sarah Stern led the way to pass legislation that, for the first time, requires federally-funded Middle East centers to offer a diversity of opinion in their outreach activities. This provides a vehicle for Campus Watch to bring those centers to account which we plan to make full use of. The 9/11, Afghanistan, and Iraq cohorts have yet to make their positive presence felt in fields like history and politics. They are still too young. As I have previously noted, their impact is likely to be felt about 2015. The study of Islam the religion is going further south, with Islamists and their fellow-travelers increasingly dominating the field.